The deadline for the 2018 Cherwell Business Awards is fast approaching, as businesses are encouraged to enter ahead of the February deadline. 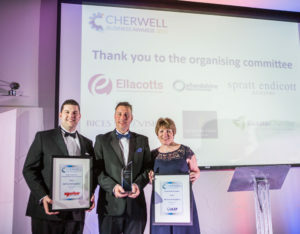 Following a launch event in November, the awards, which have established a solid reputation within the North Oxfordshire business community over the past 7 years, serve to showcase and celebrate the capabilities of individuals and organisations working within the Cherwell District. The organisers hope to attract even more entries than in previous years with a newly developed website which has full details of the award categories, important dates and how to enter. With over 6,500 eligible businesses based in the Cherwell District there is scope for 2018 to be a bumper year as awareness of the awards increases. The deadline for entries is Friday 16th February 2018, with the winner to be announced at a gala dinner in May. Find out more about the award categories.